Back in 2007, Brad Traver was sent to the Petrified Forest National Park on a temporary assignment. The nearly 150-mile park, located in eastern Arizona, is best known for its large deposits of petrified wood, a beautiful natural phenomenon, which attracts tens of thousands of visitors each year. But what stuck with him the most after this work detail had nothing to do with the millennia-old fossils for which the park is so famous. Traver, interested in historic preservation his whole life, found that he was blown away by another of the park’s unique offerings: The Painted Desert Community Complex. The Modernist building was designed by Richard Neutra and Robert Alexander. This Modernist marvel was designed by renowned architects Richard Neutra and Robert Alexander as a part of the National Park Service’s Mission 66 program, which worked to improve park facilities throughout the country after World War II. The Community Complex was, as Traver describes, “one of the most ambitious projects” to come out of the program, and was made even bolder through the Park Service’s choice of architects. However, this one-of-a-kind park facility remains relatively unknown to most Americans -- and as Traver admits, he was no exception. Traver, now the park’s Superintendent, gets to spend most of his days in and around the Modernist jewel deep in the heart of the American southwest. Now, through his position with the park, and partnership with the National Trust for Historic Preservation, he is hoping to give the building that had inspired him its day in the sun. But, as he will be the first to say, putting the Painted Desert Community Complex on the map is no small task. 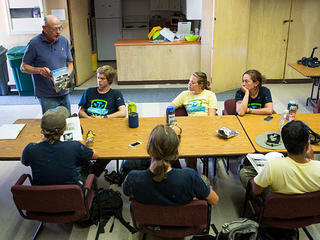 In addition to naming the structure a National Treasure in 2014, the Complex has also been the site of a HOPE Crew project this summer. 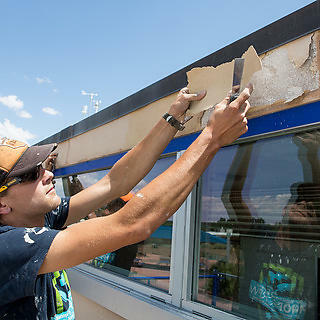 The project, overseen by preservation expert David Charlebois and undertaken by crew members from the Arizona Conservation Corps, has aimed to restore the original paint colors to the exterior, thanks to a paint analysis by the Historic Resources Group and a generous paint donation from Valspar. 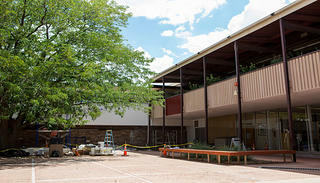 The metal accents on the Community Complex were restored to their original red color. 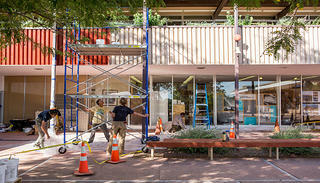 Beyond simply teaching crew members the basic skills of preservation on this project, Traver and Charlebois made it a point to inspire these young people by incorporating the history and significance of the building into their learning. Charlebois, a veteran himself of thousands of preservation projects, also found himself inspired by the work of the crew itself. Not only did they prove themselves to be capable apprentices, they also showed they have what it takes to be stewards for this, and other important pieces of architecture, for years to come. 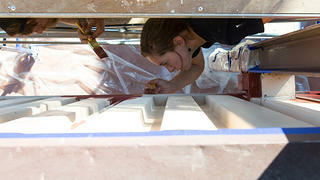 This project was made possible in part by a generous donation from Valspar. 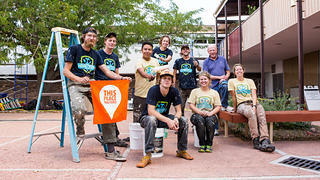 Through the HOPE Crew and National Treasures programs, the Painted Desert Community Complex has found itself in the news multiple times, including pieces featured on MSN.com and in the Arizona Journal. It’s just the beginning, but work like this will continue to, as Traver says, turn the tide for a building that has touched these lives, and has the potential to inspire many more in years to come. Tom Wall was the associate manager of Community Outreach. His background includes television production, journalism, nonprofit communications, and marketing. Originally from Santa Fe, New Mexico, Tom is a graduate of the George Washington University, with a B.A. in Journalism and Mass Communication.